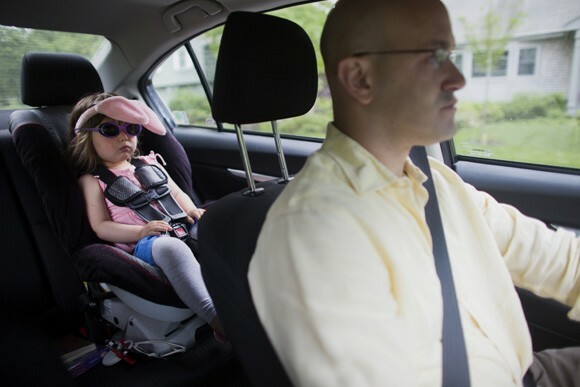 Fred Bermont, daughter Elyse Bermont (age 2.5, right) and son Dylan Bermont (age 9 months) pose for a portrait before he drops the kids off at day-care in Lexington, Massachusetts, USA, before he goes to work on June 9, 2014. Bermont is the father of two children and shares parenting duties with his wife, Jen Bermont. Fred usually takes care of the morning routine, including feeding, dressing, and dropping the kids off at day-care, and Jen picks them up and watches over them in the afternoon. Fred is a Senior Clinical Standards Specialist at Shire, a pharmaceutical company with headquarters in Lexington. Fred Bermont plays with daughter Elyse Bermont (in tent, not pictured, age 2.5) and son Dylan Bermont (age 9 months) in their home in Lexington, Massachusetts, USA, before he goes to work and drops the kids off at day-care on June 9, 2014. Bermont is the father of two children and shares parenting duties with his wife, Jen Bermont. Fred usually takes care of the morning routine, including feeding, dressing, and dropping the kids off at day-care, and Jen picks them up and watches over them in the afternoon. Fred is a Senior Clinical Standards Specialist at Shire, a pharmaceutical company with headquarters in Lexington. 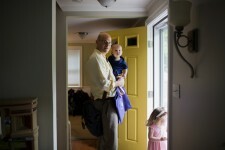 Fred Bermont drives his children Elyse Bermont (age 2.5, rear) and Dylan Bermont (age 9 months, not pictured) to day-care in Lexington, Massachusetts, USA, before he goes to work on June 9, 2014. Bermont is the father of two children and shares parenting duties with his wife, Jen Bermont. Fred usually takes care of the morning routine, including feeding, dressing, and dropping the kids off at day-care, and Jen picks them up and watches over them in the afternoon. 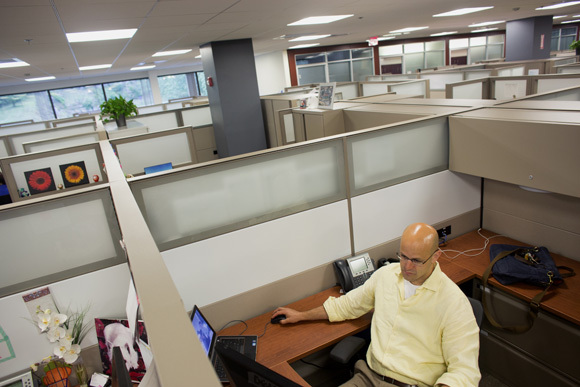 Fred is a Senior Clinical Standards Specialist at Shire, a pharmaceutical company with headquarters in Lexington. 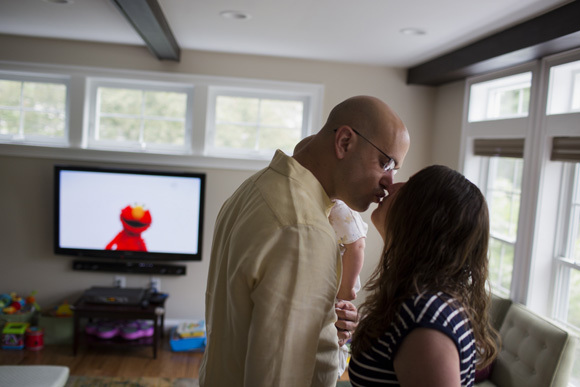 Fred Bermont and daughter Elyse Bermont (age 2.5) watch Sesame Street in their home in Lexington, Massachusetts, USA, before he goes to work and drops the kids off at day-care on June 9, 2014. Bermont is the father of two children and shares parenting duties with his wife, Jen Bermont. Fred usually takes care of the morning routine, including feeding, dressing, and dropping the kids off at day-care, and Jen picks them up and watches over them in the afternoon. Fred is a Senior Clinical Standards Specialist at Shire, a pharmaceutical company with headquarters in Lexington. 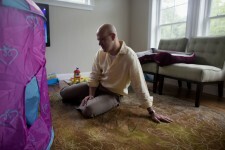 Fred Bermont plays with daughter Elyse Bermont (left, age 2.5) and son Dylan Bermont (age 9 months) in their home in Lexington, Massachusetts, USA, before he goes to work and drops the kids off at day-care on June 9, 2014. Bermont is the father of two children and shares parenting duties with his wife, Jen Bermont. Fred usually takes care of the morning routine, including feeding, dressing, and dropping the kids off at day-care, and Jen picks them up and watches over them in the afternoon. Fred is a Senior Clinical Standards Specialist at Shire, a pharmaceutical company with headquarters in Lexington. Fred Bermont plays with daughter Elyse Bermont (age 2.5) and son Dylan Bermont (age 9 months) in their home in Lexington, Massachusetts, USA, before he goes to work and drops the kids off at day-care on June 9, 2014. Bermont is the father of two children and shares parenting duties with his wife, Jen Bermont. 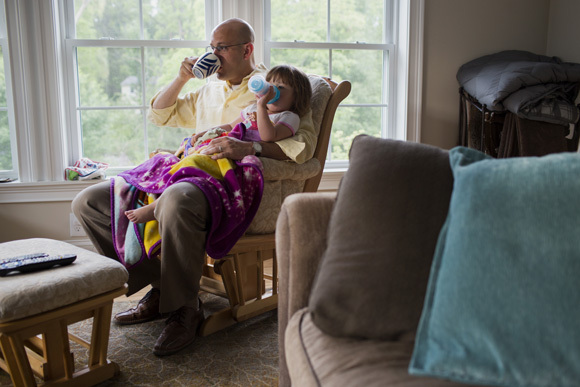 Fred usually takes care of the morning routine, including feeding, dressing, and dropping the kids off at day-care, and Jen picks them up and watches over them in the afternoon. Fred is a Senior Clinical Standards Specialist at Shire, a pharmaceutical company with headquarters in Lexington. 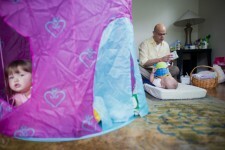 Fred Bermont dresses son Dylan Bermont (age 9 months) while daughter Elyse Bermont (left, age 2.5) plays in a tent in their home in Lexington, Massachusetts, USA, before he goes to work and drops the kids off at day-care on June 9, 2014. Bermont is the father of two children and shares parenting duties with his wife, Jen Bermont. Fred usually takes care of the morning routine, including feeding, dressing, and dropping the kids off at day-care, and Jen picks them up and watches over them in the afternoon. Fred is a Senior Clinical Standards Specialist at Shire, a pharmaceutical company with headquarters in Lexington. Fred Bermont kisses wife Jen Bermont before she leaves for work while holding son Dylan Bermont (age 9 months) in their home in Lexington, Massachusetts, USA, before he goes to work on June 9, 2014. Bermont is the father of two children and shares parenting duties with his wife, Jen Bermont. Fred usually takes care of the morning routine, including feeding, dressing, and dropping the kids off at day-care, and Jen picks them up and watches over them in the afternoon. Fred is a Senior Clinical Standards Specialist at Shire, a pharmaceutical company with headquarters in Lexington. 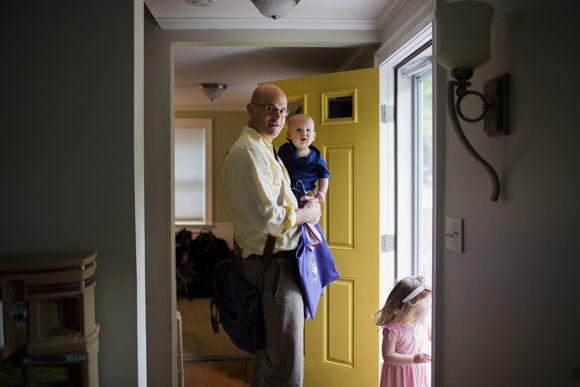 Fred Bermont holds son Dylan Bermont (age 9 months) as he drops the kids off at day-care in Lexington, Massachusetts, USA, before he goes to work on June 9, 2014. Bermont is the father of two children and shares parenting duties with his wife, Jen Bermont. Fred usually takes care of the morning routine, including feeding, dressing, and dropping the kids off at day-care, and Jen picks them up and watches over them in the afternoon. Fred is a Senior Clinical Standards Specialist at Shire, a pharmaceutical company with headquarters in Lexington. Fred Bermont is a Senior Clinical Standards Specialist at Shire, a pharmaceutical company, in Lexington, Massachusetts, USA, on June 9, 2014. Bermont is the father of two children and shares parenting duties with his wife, Jen Bermont. Fred usually takes care of the morning routine, including feeding, dressing, and dropping the kids off at day-care, and Jen picks them up and watches over them in the afternoon. 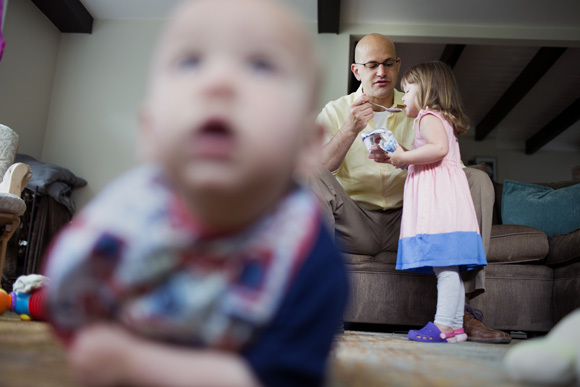 Fred Bermont and daughter Elyse Bermont (age 2.5, right) eat before he drops the kids off at day-care in Lexington, Massachusetts, USA, before he goes to work on June 9, 2014. Bermont is the father of two children and shares parenting duties with his wife, Jen Bermont. Fred usually takes care of the morning routine, including feeding, dressing, and dropping the kids off at day-care, and Jen picks them up and watches over them in the afternoon. Fred is a Senior Clinical Standards Specialist at Shire, a pharmaceutical company with headquarters in Lexington. 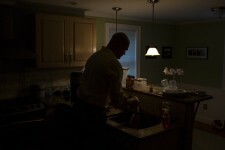 Fred Bermont gets ready for work at his home in Lexington, Massachusetts, USA, on June 9, 2014. Bermont is the father of two children and shares parenting duties with his wife, Jen Bermont. Fred usually takes care of the morning routine, including feeding, dressing, and dropping the kids off at day-care, and Jen picks them up and watches over them in the afternoon. Fred is a Senior Clinical Standards Specialist at Shire, a pharmaceutical company with headquarters in Lexington. For a Wall Street Journal story published in advance of Father’s Day, I photographed Fred Bermont and his family during their morning routine in Lexington, Massachusetts. 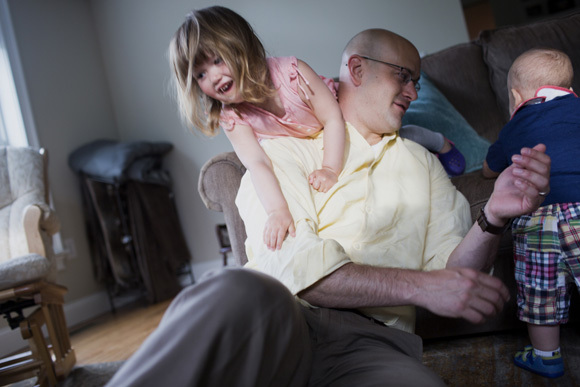 The story focused on dads taking over their share of parenting duties. Fred, in this case, takes care of breakfast, getting the kids ready for the day, and taking them to daycare before he goes to work. These are the kind of assignments I really like (though I would’ve liked a start time later than 6:15am!) because I could just be a fly on the wall documenting this family’s story. Thanks again to Parker at the WSJ for the great assignment. Here’s the slideshow that the Journal ran, and here’s BagNewsNotes’ take on the pictures and story.